Trinity Evangelical Lutheran Church was organized on December 3, 1886, and in the following year a church was built three miles east of Fisher. very near the Fisher/Lowell Township line. 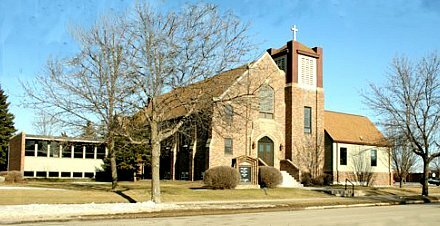 The church has also been known as the "German Lutheran Church." In 1941, a new church was built in the town of Fisher, and it was dedicated on November 9, 1941. Trinity Lutheran Church is now a congregation of the Lutheran Church-Missouri Synod. It now uses the Greenwood Cemetery, in Section 22, east of Fisher.